The only problem with this popular testing tool was its lack of documentation-until now, that is. For this, O'Reilly went right to the source, as Sebastian Bergmann, the author of PHPUnit Pocket Guide, also happens to be PHPUnit's creator. 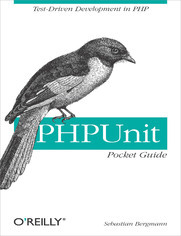 This little book brings together hard-to-remember information, syntax, and rules for working with PHPUnit. It also delivers the insight and sage advice that can only come from the technology's creator. Coverage of testing under agile methodologies and Extreme Programming (XP) is also included. The latest in O'Reilly's series of handy Pocket Guides, this quick-reference book puts all the answers are right at your fingertips. It's an invaluable companion for anyone interested in testing the PHP code they write for web applications.